This Error Message Article explains the BACKTRACK error message “Unable to obtain license information” and details how to fix the underlying problem that caused it to appear. BACKTRACK workstation is unable to locate the license information required to run the software. This is generally applied to the network installation of BACKTRACK and not the stand-alone or server install. 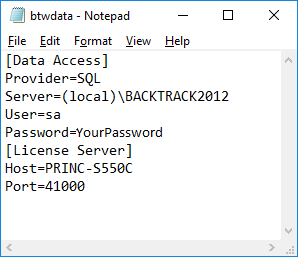 The location for the license information can be found on the BACKTRACK server at c:\programdata\Teklynx\BACKTRACK\btwdata.ini. Confirm that the BACKTRACK server is online and accessible from the BACKTRACK workstation. Host must be a valid computer and the port specified must not be blocked.